WillowTree Apps wants to tap into your Facebook network to help you discover new places, movies, bands, and books. The app maker, which does most of its business by helping others build mobile apps, debuted Likes for iPhone at Macworld | iWorld 2012. The app pulls all of the “likes” that have been entered into Facebook, and gives you recommendations based on what your Facebook friends have liked. Unlike other recommendation sites and apps, such as Yelp, that make you comb through the general public’s opinions, Likes wants to offer users more personal and relevant recommendations. As the app’s slogan goes, “Your friends know best.” But Likes doesn’t only pull likes from your immediate Facebook friends, it also taps into ratings from friends of friends. 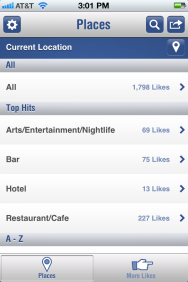 According to WillowTree Apps, this is the first app that uses Facebook’s likes data. Of course, you’ll have to sign into to Facebook to use Likes. Once you’re set up, you can see which places, ranging from bars to universities, have garnered the most of your friends' likes. You’ll also be able to see likes for other stuff such as books and magazines, companies, movies and television shows, people, brands, and more. For instance, when I used the app, The Beatles topped the list for most-liked band. (Radiohead was a close second.) And I could see which of my Facebook friends liked the bands. Since the app totally relies on Facebook likes, it isn’t especially useful for people who don’t have many Facebook friends or whose friends aren’t active “likers” on the social network. Personally, I don’t “like” many things on Facebook. Also, the majority of my Facebook friends don’t live near me, so when I tried to find a restaurant within five miles of my current location, only five showed up, each with only one like all from the same person. Likes certainly looks as if it has potential for active Facebook users, though. It’s available for free on the App Store and requires iOS4.3 or later. Generic Company Place Holder Likes!